There are many things we tend to neglect in life, and one of them is our household garbages! That's definitely something that we need to change as a society. Especially since nowadays, we are capable of finding solutions to our problems quickly and easily, and there are many well-priced services available when we are talking about dumpster rental. It's also important to make sure we are doing all that we can to help our environment in the hard times that it's having now due to us. 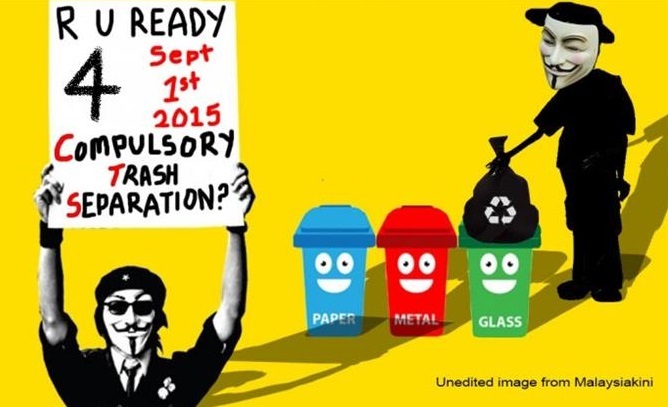 But thanks to our Malaysian culture, in fact the process of handling wastes is not that easy after all. We often dump everything from food to recyclable items into one single bag (Even the bag might not be biodegradable itself!) and think, "Aiya the trash collector will do the job, why should we bother?" Let's face the reality, many people take the shortcut by just dumping everything unscrupulously, but do you realise it is no longer allowed? Our government has introduced to us the Compulsory Trash Separation program where we must separate the wastes into different bins accordingly. 1. We don't cook much. 2. We don't eat/drink anything in cans / bottles / jars. 4. We don't buy newspapers. Yet....it is not an excuse not to split the trash! If your house has alot of different garbages, it may be a headache to manage all of them. 1. (Most Important!) 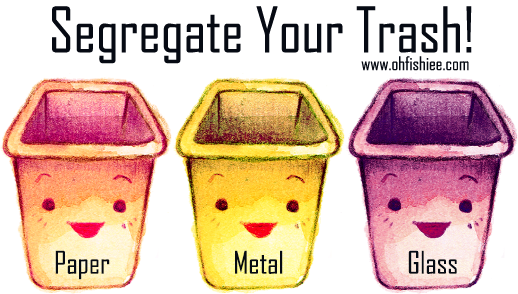 Separate your trash by type -- paper products, plastics, metals, glass and food waste. Empty and rinse all food containers. 2. Sort out all appliances and electronics from your tin and aluminum cans as they can be recycled separately. 3. Divide your food waste into animal and compostable plant products. 4. Remove styrofoam, bubble wrap and plastic caps from bottles as they are not recyclable. 5. Gather all of the non-recyclable garbage and dispose of it in your regular trashcan. In fact, Malaysia already has numerous waste-to-energy (WTE) facility to process solid waste and generate electricity, as part of the energy recovery mechanism. It enables recovery of recyclables to release methane-rich biogas for enhancing power generation. Sounds too technical? Well, that's a huge picture of what our government has been doing, but how can we relate to that? Oh certainly we can! Just reduce and recycle the waste as much as possible, separate the trash, keep our home and community clean at all times. Good sharing adik fish...sis pun kena insaf kan diri byk2 kitar semula. Interesting post on waste! We need to learn how to properly separate our waste like in South Korea! I am starting to do this slowly. sudah ada kesedaran sikit. I've always been a strong advocate proper rubbish disposal and recycling but can't seem to get those living in my household to do the same. After reading your post, I'll implement it in my home and hopefully my family members develop this good habit of separating trash. Thanks ohfishiee! This education should start from home, enhance in schools and practice by many. If the west can do it, for sure the east can do it better! Start reuse and recycle to reduce so that our future generations can enjoy the earth. I already did like thaht split the sampah into the categories ! Thanks for the PSA fish! We really need to play our part in helping and sustaining the environment. Too much wastage nowadays, it's really sad to see our Mother Earth so polluted! yeah we doing the separate waste and recycle products everyday. Important to do that for better future generations. I try to separate my trash as well although I am not always successful because I can't decide which goes where. I hope to be better in this. Very good effort. Everyone should start doing the same, save our Earth! Great thing to do! I have been doing this for years. Some people think this is too troublesome but why not if you can save the environment. Means I need to get another 2 bins to separate the rubbish but my place is limited. Don't think can put another 2. Its good to start somewhere!!! Malaysia did not have much education seperation of our rubbish bin according to it categories. While in other country like Singapore, I see the different thing. Glad, Malaysia start to create awareness regarding this. agree that we should at least segregate our household waste before throw it out. If everyone can contribute a big of effort it will make a big impact on the environment. This is a good education for Malaysians. We must start to learn and to adapt. Good info! betul. i pun tinggal sorang, how many sampah je yg i produce..hehe..good info fish! We should separate the waste, as I did that during my stay at Tokyo. thanks for sharing!!! need to share to public and start to separate the waste..